Being a silhouette shooter, single-shots are a big part of our game. 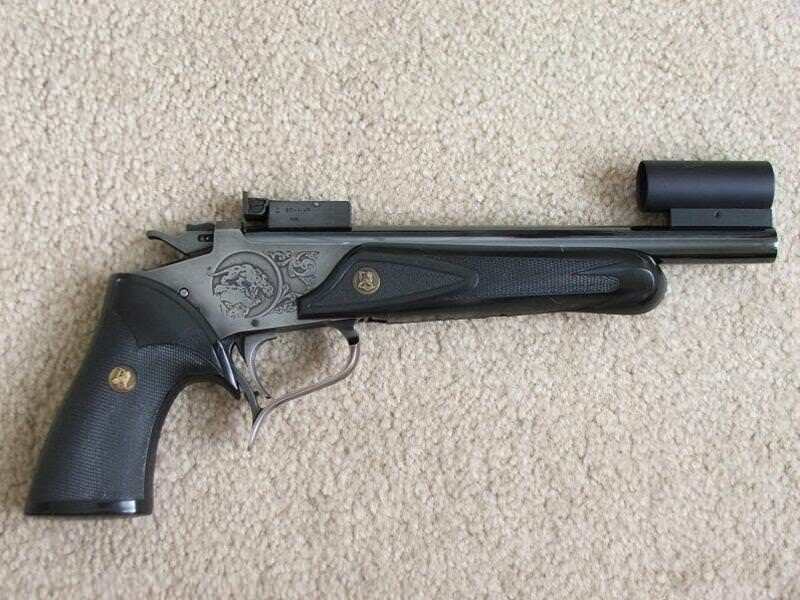 The XP-100 is my favorite platform, but I also enjoy the break-open guns for their versatility and simplicity. 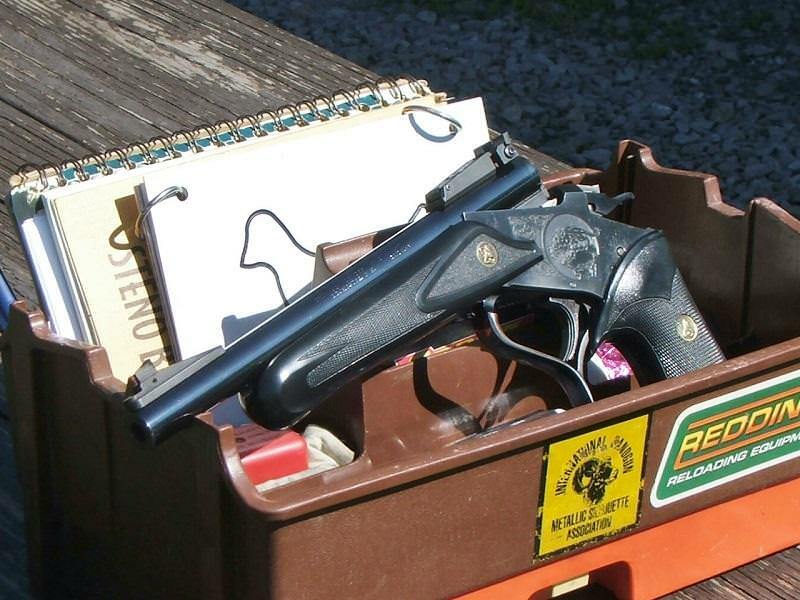 I’ll start with my OTT Encore with octagon barrel, Bo-Mar sights, Georgia Jim furniture in one of my favorite cartridges…the .414 SuperMag. 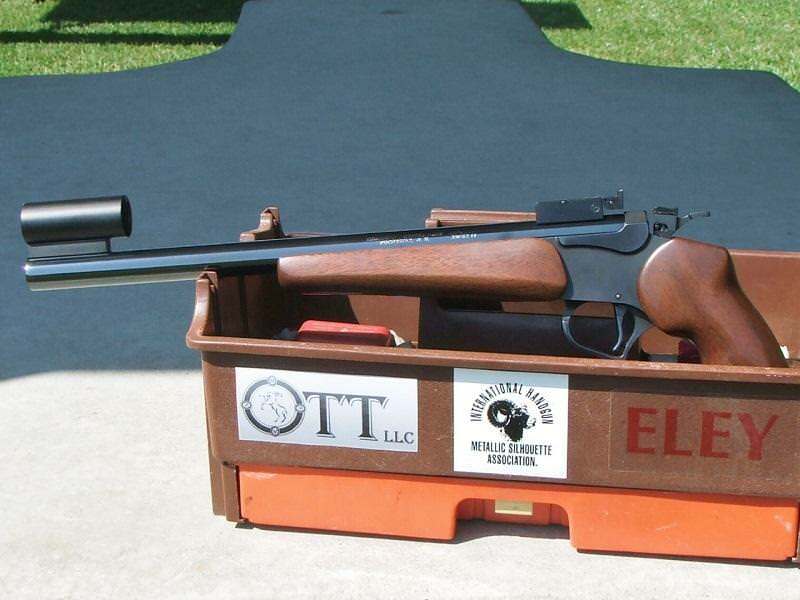 My other OTT Encore with fluted 15″ barrel in .414 SuperMag. 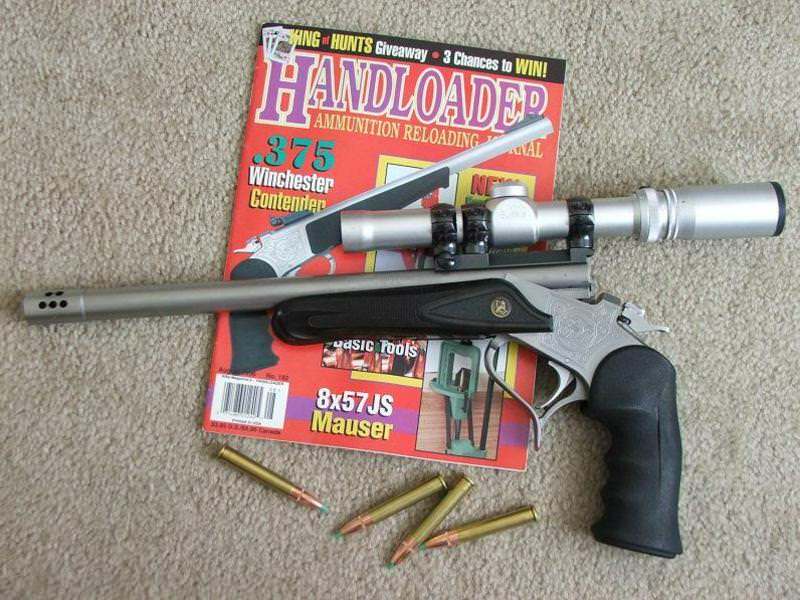 This one is the “mistake” that shoots as well as a bolt gun. 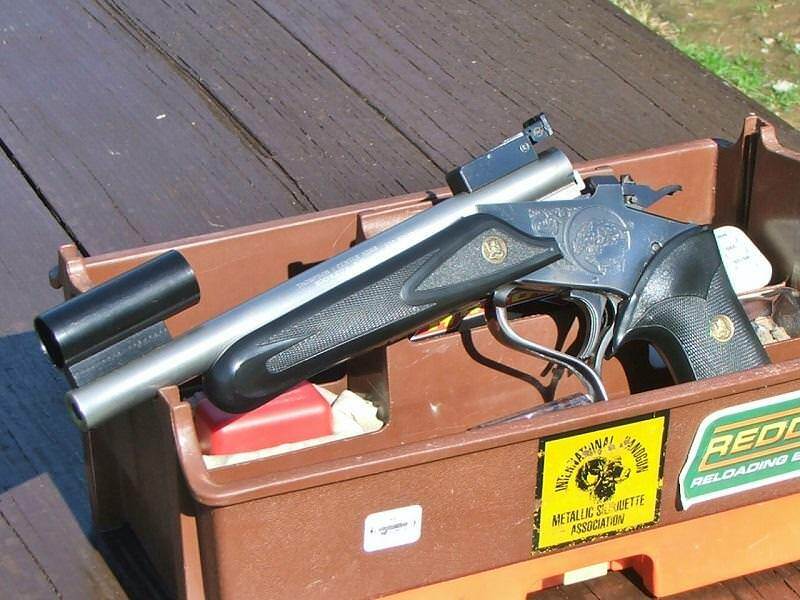 A G2 with 14″ barrel rechambered to 10mm Magnum. 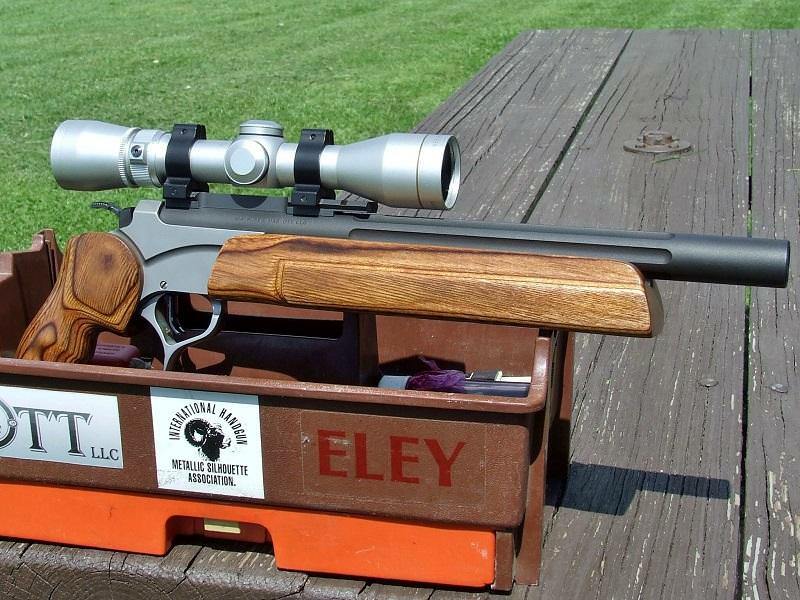 Here’s a mean one…SSK 12″ Contender in .444 Marlin with 2x Burris scope. It’s been MagnaPorted, but I liked it better before when it had no brake. Encore with factory 7mmBR barrel and Bo-Mar sights. TC built a few 10″ barrels for the Encore when it first came out, just for the silhouette crowd. They also offered a 10″ 7mm-08 and a .44 Magnum. 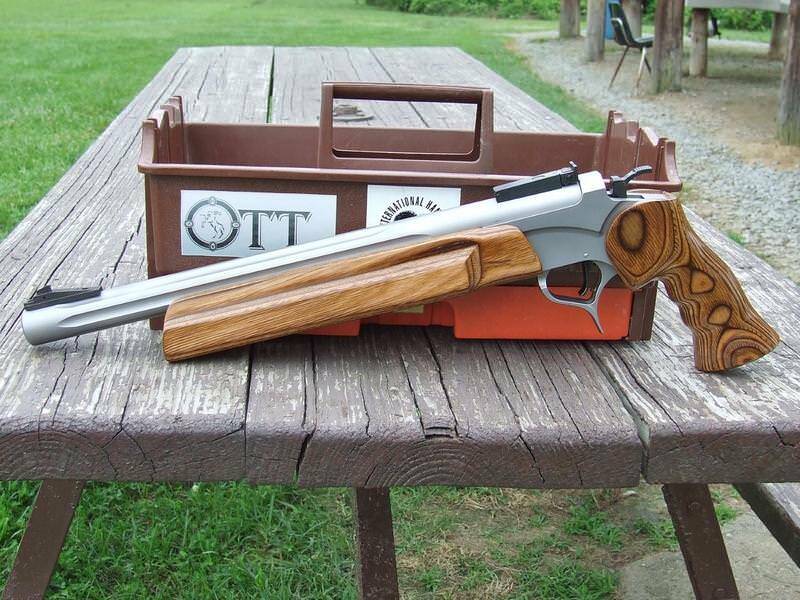 My latest Encore barrel, a 14″ OTT in .375 Supermag. This one still needs good sights. 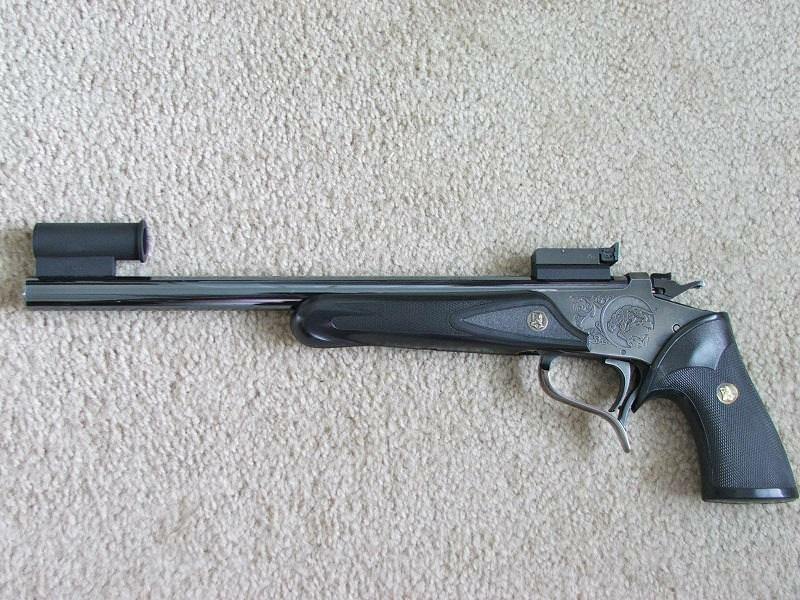 Another SSK barrel, this one a 14″ Contender in 6.5mm JDJ, basically a necked-up improved .225 Winchester case. Leupold 4x scope and that brake came with the barrel, it is a Holland. An old friend, my first Contender. 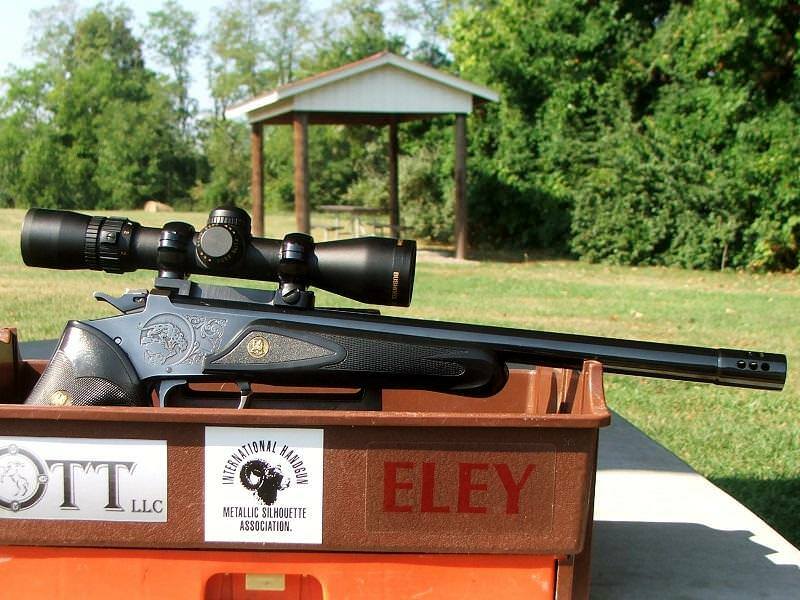 10″ .22LR Match with B&L Elite 3000 2-6x scope. 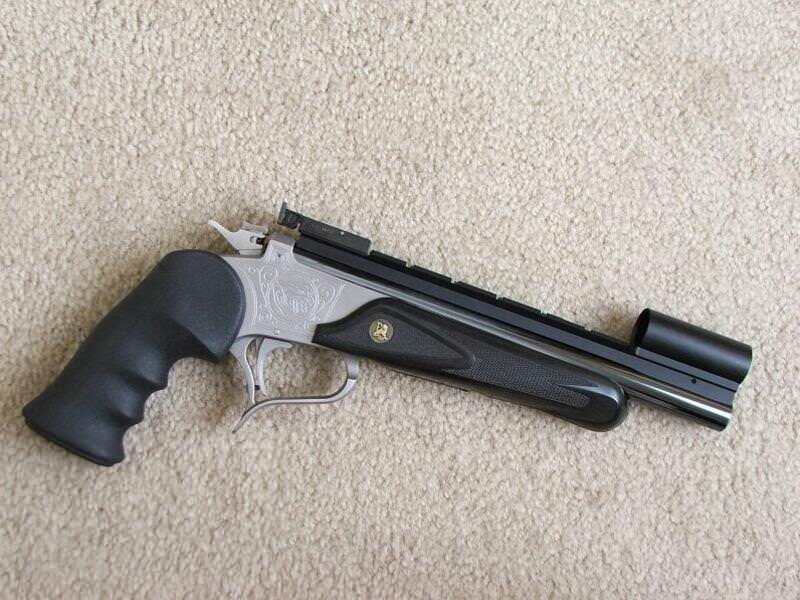 Contender 10″ .300 Whisper, very mild and accurate, either subsonic or supersonic. 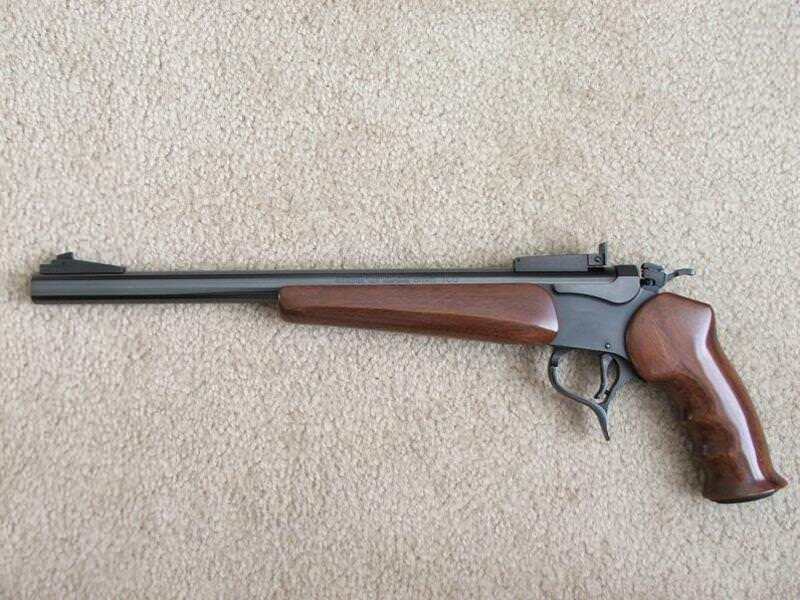 Plain old original .357 Maximum for Production category silhouette. 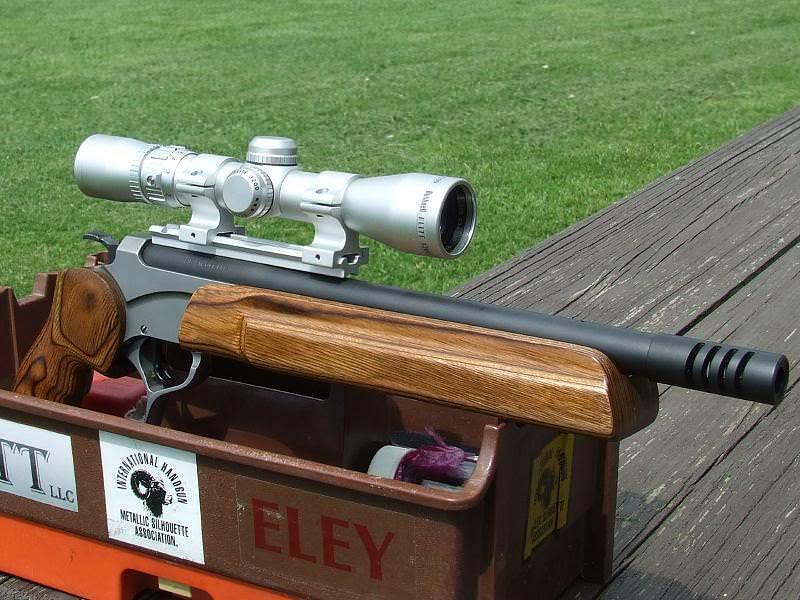 14″ Hunter in .375 Winchester with Burris 1.5-4x scope. One of my wife’s favorite plinkers also. 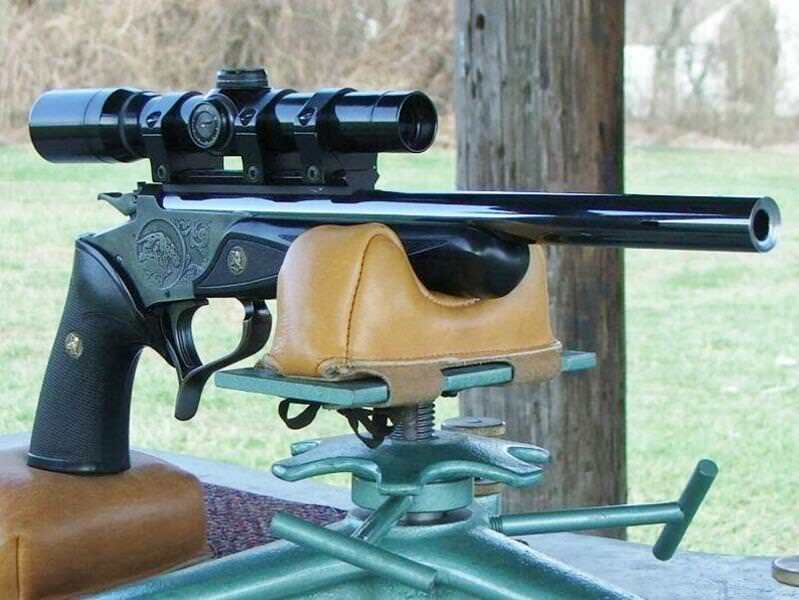 Won a State silhouette championship with this gun and a perfect 80×80 many years ago. Very pleasant to shoot with the brake. 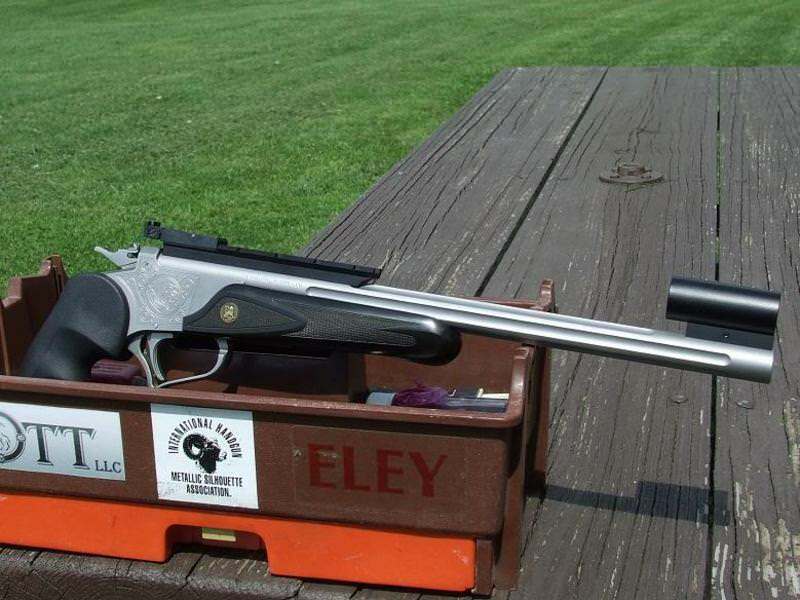 10″ Contender in 10mm Auto. This is a blast to shoot at 200 meters. It WILL take down the rams with 165 grain + loads. I also have a few others in identical configuration in 7mm TCU, 7-30 Waters, .30 Herrett and .41 Magnum. 6.5mm TCU with full-length Ken Light rail and Bo-Mar sights. This was my first centerfire Contender barrel, a 14″ in .30-30 Winchester. With pointed bullets, it will hold it’s own with any other .30 caliber case. I won this in a drawing at the 2002 IHMSA Internationals. One of the first G2 Contenders on the market, I had my choice of barrels, so I got this Custom Shop 14″ 6mm TCU. I fired the first ever 40×40 in the world with a G2…it will stay all-factory just like this. Another G2 with 14″ Hunter barrel in 7-30 Waters, Bushnell Elite 3200 2-6x scope. 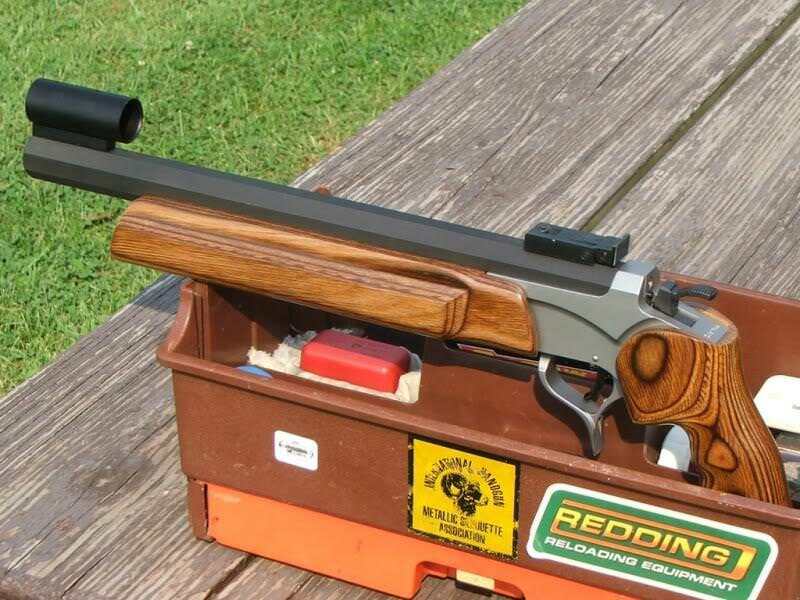 I had OTT make me a 15″ G2 barrel in .17 Mach 2. Just for grins, Mike designed this tank-brake to control the vicious recoil of the M2 round. 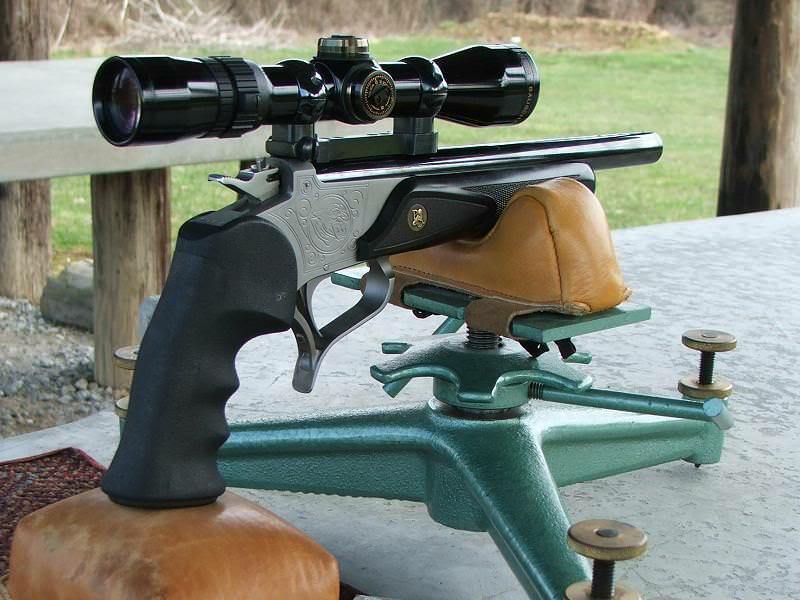 I thought it would be fun to do…with the Leupold 6.5-20x scope, the gun just doesn’t move on the bench. 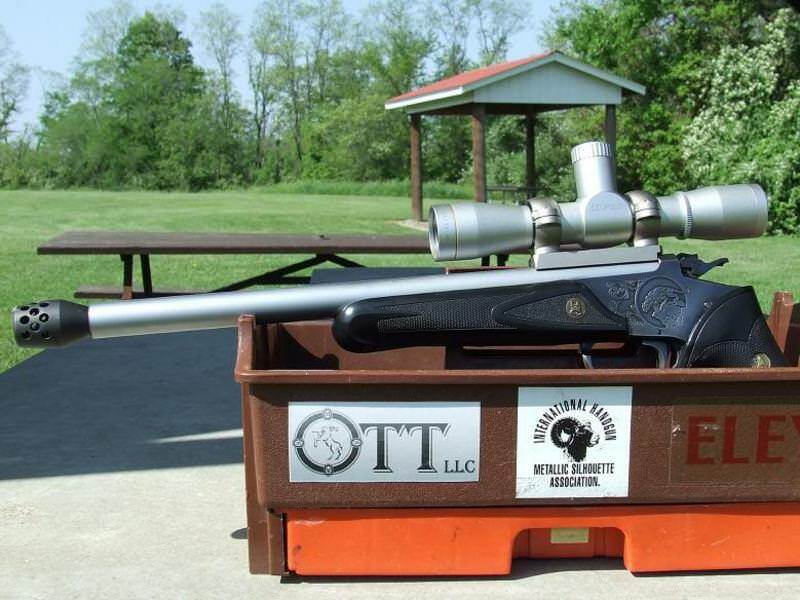 OTT rechambered this factory 12″ Encore .44 Magnum barrel into a .445 SuperMag, then added one of his superb shark-gill brakes. 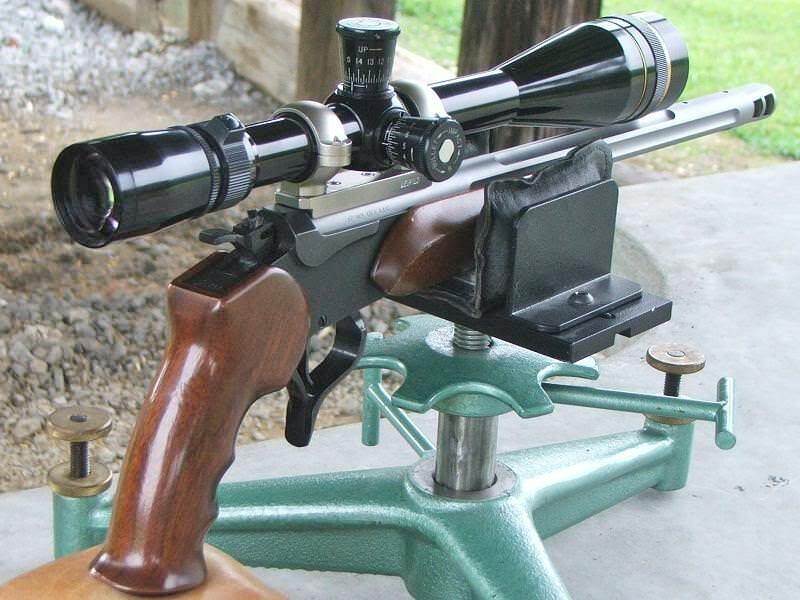 Elite 3200 2-6x scope. I’ve been on a nostalgia kick from the older silhouette days, so a couple years ago, I ordered this fluted barrel from OTT. A 15″ stainless in 7mm International Rimmed, or 7R, it was a very popular, early Unlimited cartridge that Elgin Gates designed. Many 7mm TCU barrels were rechambered by Elgin for this round. The 7R is a .30-30 case, necked to 7mm with a 38 degree shoulder and straighter case. 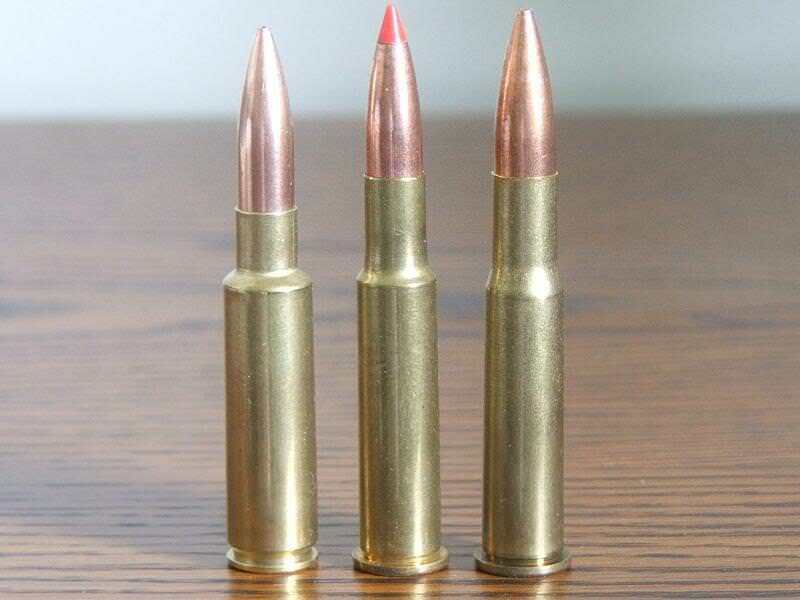 The 7mm International Rimmed is based on the .30-30 Winchester case, necked down to 7mm and fireformed to give it a straighter case taper and 38 degree shoulder, fully formed case shown in the middle. The right case is the .30-30 necked up before fireforming, the left is the 7mm International, the inspiration for the 7R. 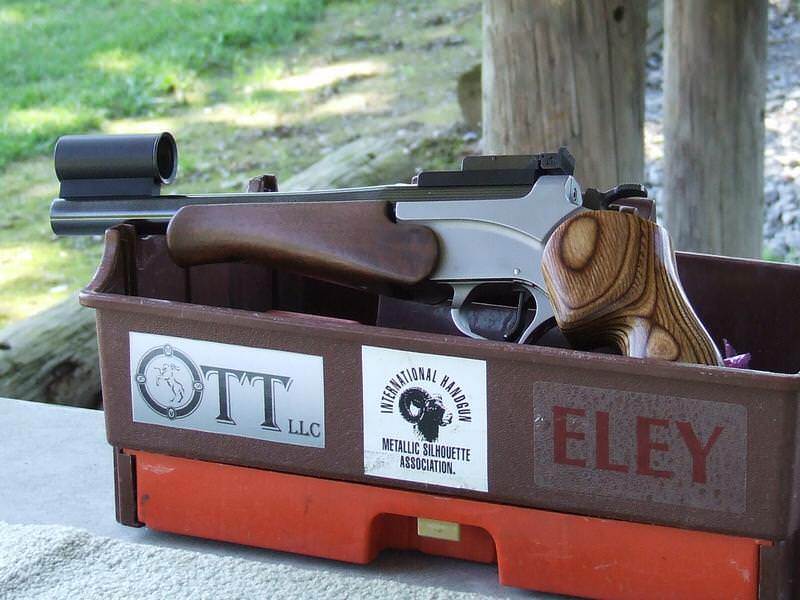 Elgin Gates had the 7mm International for bolt-action guns, and wanted a similar case that was easy to form for the TC guys. Great…now how am I supposed to deal with all this on my desk! I'll have you know that you've totally reuined me for any “standard” Contenders or Encores. There's some that pop up here locally from time to time, that are just plain boring compared to the beauties you've got. One of these days I'll get one.